As more and more people switch to being dairy-free the shelves in the shops are becoming more and more packed with dairy-free milk alternatives. Gone are the days where it was only soya or almond milk to choose from, there's now everything from coconut milk to hemp milk which can make it a little confusing when deciding which one is the best for your health, which tastes the nicest and which is most sustainable. I've tried my fair share of dairy-free milks and I've done my research into the pros and cons of them all, so I thought it'd be a good idea to share my experiences and my knowledge with you to help you pick the best milk-alternative for you. But first, why should you make the switch? Dairy milk isn't the same as it once was, before it gets to be in your fridge it's been through a long process that strips it from nutrients, it's full of hormones and antibiotics and it's pasteurised. Not only this but the milk comes from animals that have been unfairly, inhumanly and cruelly treated. Modern milk production has been proven to be the cause of ever-growing dairy intolerances which causes symptoms such as bloating, diarrhoea, constipation, skin conditions and headaches. Modern milk consumption has also been linked to chronic disease and is actually been found to weaken bones over time. The good news is that there are so many alternatives now on the market, so you can enjoy your cereal or afternoon cuppa without having to consume dairy milk - yippee! I'm starting off with what was always the most common and most popular dairy-free milk. Soya milk's popularity has plummeted in recent years due to the now extensive range of competition and the fact it's actually not so good for you at all! Soya was always branded as healthy but the more research that's done the more it seems actually it's not all it's cracked up to be and it'd be a lot safer to steer clear of this alternative. Soybeans are legumes that originated in East Asia but are now being produced in mass scale in the USA, where over 90% is genetically modified and processed. Whole soybeans are rich in micronutrients but they also contain high levels of phytates which is a substance that binds minerals in our digestive system making them really hard to absorb. Soybeans may contain fatty-acids but they are Omega-6 polyunsaturated fats linked to inflammation and other health issues. On top of this studies have shown soy to disrupt thyroid function and interfere with your all important hormone balance. Bottom line, avoid soya milk when possible! On to nut milks, which includes firm health-favourite almond milk. Nut milks are probably the most popular dairy-free milk alternatives on the market today, with them being easily-found in supermarkets and inexpensive it's no surprise many people reach for them. 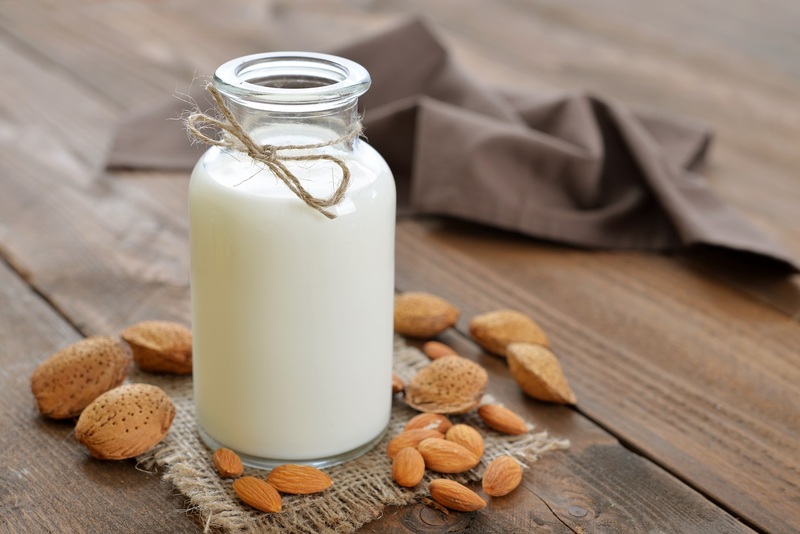 Almond milk is the most common but you can get hazelnut milk, cashew milk and even macadamia milk which are all made by soaking the nuts, blending them with water then straining them....easy peasy and super healthy right? Well, when you make your own nut milk it's amazing, however many manufacturers add all sorts to their nut milks like thickening agents, emulsifiers, salt and artificial nutrients which aren't the best things to be putting into your body. That being said there are brands who don't add weird, unnecessary ingredients to their milks and I'd highly recommend checking out Rude Health for the yummiest, cleanest nut milk. I tend to use nut milks mostly in baking, almond milk in particular is the perfect dairy alternative in baking as it provides that creaminess without a strong taste. I avoid nut milks in hot drinks as they curdle and prefer using other milks on cereals and granola (more on those later!). I'm not talking about the thick coconut milk you get in cans but the yummy dairy-free alternative that you'll find next to the almond milk in the supermarket. Again many manufacturers add other ingredients to their products but getting coconut 'milk' in it's purest form will provide you with lots of yummy nutrients such as vital fatty-acids! I find coconut milk particularly delicious in porridge as it's ultra creamy and gives the oats a slight coconut flavour. I don't like it in hot drinks or baking because I find the flavour a little too strong for these. Brown rice milk could well be my favourite dairy-free milk, if you haven't tried it yet then get on it! Brown rice milk is thinner than the other alternatives but it's naturally sweeter which makes it a winner for porridge and cereal! I also love to use brown rice milk in hot drinks like matcha latte as it doesn't curdle and adds a slight sweetness which is so comforting and delicious. Rice milk doesn't contain many nutrients, but nor does it contain harmful nasties that can be found in alternatives like soya and it's easy on the digestive system. Oat milk is similar to rice milk in terms of production and the nutrients you get out of it. It's one of the creamier dairy alternatives and it's my family's favourite to add to hot drinks as it doesn't curdle or separate at all and makes the coffee or tea nice and creamy without adding too much flavour. This option is also another one that works extremely well in porridge or on cereal. Oat milk is the cheapest and easiest dairy-free milk to make at home as well, in fact 1 litre would only cost you about 70p to make! Recipe here. If you have coeliac disease like me make sure the oat milk you buy is certified gluten free. Hemp milk is one of the most nutritious dairy-free milks out there as it's a brilliant source of omega-3, just 250ml provides 50% of your recommend daily intake! Omega-3 is super important, it helps maintain a healthy heart and keeps your skin glowing and hair shiny. Hemp milk has the perfect milky consistency and a delicious slightly nutty flavour that is heavenly in a big bowl of porridge! I personally don't like hemp milk in hot drinks as I don't like to actually taste the milk more than the tea, but it doesn't curdle. When you buy hemp milk make sure you get a product made from raw hemp! Added sugar - It's ridiculous how many dairy-free milks have added sugar in them, why would you put sugar in milk? Weird! Look out for the unsweetened versions. Carrageenan - This is common in non-dairy milks as it's a thickener, but it's indigestible and there have been many studies to show a correlation between consumption of carrageenan and the development of cancer cells. These studies were done on animals though, and experts suggest carrageenan may have no effect on humans if consumed in small doses. I personally don't like risking it so it's something I avoid, at least until there's been enough research to provide clear answers. Vegetable Oil - A very common ingredient in non-dairy milks and one to avoid! Vegetable oils are created using toxic solvents and cause a large amount of free-radicals. This oil is an unhealthy oil, bad for our heart and our body in general. Try and go for the brand that adds the least ingredients - the more pure and natural the better! Making the switch from dairy milk to dairy-free will probably improve your digestion, could clear up skin issues, benefit your bone health, give you more energy and you'll no longer be supporting a cruel industry. With so many milk alternatives out there I guarantee you'll find one you love! It all comes down to personal taste, your budget, your digestion and what's available in your area so do some experimenting, try different options and test them all out....there'll be one that's perfect for you. What Is Matcha & Why Is It So Amazing?